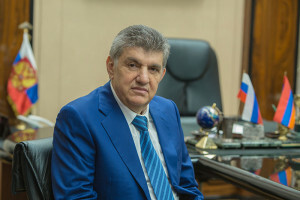 Personally, and on behalf of the organizing committee of the Forum, I would like to express my gratitude to the Ministry of Industry and Trade of the Russian Federation and the Minister, Denis Manturov, as well as to the Eurasian Economic Commission and the Chairman of the EEC Board, Tigran Sargsyan. As a result of a successful cooperation, we are holding this large-scale event here for the third consecutive year. We can confidently affirm that the Eurasian Economic Union, the programs and initiatives of which we are promoting at this Forum, is currently one of the most successful integration projects that will boost an increase in welfare of population and preservation of cultural, historical and social unity of the EAEU through the development of economic relations. I am pleased to highlight the fact that the interest in our Forum is increasing every year. The number of Forum participants has doubled, its geographic outreach has expanded, and I am sure that the outcomes will exceed our expectations and be no less significant than last year. I would like to remind you that the main outcomes of the IFEP 2017 were the twelve signed cooperation agreements, including the agreement on Free Economic Zone on the border with Iran. The distinctive feature of the International Forum of the Eurasian Partnership is that the Forum is permanent and is not limited to the days held here in Armenia. IFEP offices operate both in Yerevan and in Moscow. Perhaps, it is worth opening the Forum representative offices in all the capitals of the EAEU countries, as well as in other parts of the world. I also find it expedient to create a club system of entrepreneurs of the EAEU countries in order to strengthen and expand horizontal relations between business communities and promote investment. The work of our Forum intertwines with the events of the Eurasian Week this year, the largest international business forum in the EAEU space that will definitely lead to expansion of mutual opportunities for effective dialogue between business community and regulators at national and supranational levels. The huge potential of one hundred and eighty million Eurasian market arouses great interest. Our business cooperation experience indicates a high interest of external partners in the development of economic relations with the EAEU: both of the European Union that has an agreement on comprehensive and enhanced partnership with Armenia, and of the other regions of the world. It is not a secret that there is a great number of critical political issues and threats hindering economic development in the Eurasian space, as well as in other parts of the world. As it is known, business needs stability and investments are made in case of a clear planning time-frame. I am convinced that economy with a predictable and stable policy may unite more reliably than any other undertakings. Specifically, economy and economic integration must become the circulatory system of the Eurasian Union that will strengthen the whole organism, unfold new potentials and transform Eurasia into a prosperous region free from wars and conflicts through the influx of new ideas, investment projects and opportunities. It is worth mentioning that the dynamics of the internal market of the EAEU is impressive and, at the same time, the potential of the EAEU countries is still not fully utilized. Moreover, this potential is much greater today. The geography of each EAEU member country provides additional advantages for expanding the Eurasian economic partnership with neighboring countries, including global and regional players on the world market. The significance of this fact brought to our Forum business representatives from a number of non-EAEU countries, such as the USA, France, Iran, India, etc. Dear friends! Armenia is the smallest of the EAEU countries. However, even such a small country becomes immense and its possibilities increase many times when Diaspora comes into play. I would like to mention that this year a scientific session will be held for the first time within the framework of our Forum with the participation of world-renowned scientists of the Armenian Diaspora. I am sure that scientific research works presented at this session, as well as during other panel sessions and roundtable discussions, will arouse great interest among representatives of business community. Opportunities for cooperation are really great. Our Forum is dedicated to the success of “Technological breakthrough and potential opportunities of the EAEU countries” and in many ways, it depends on each of the participants of the third International Forum of the Eurasian Partnership.